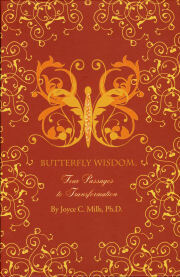 Home > Second Chance > Butterfly Wisdom: Four Passages to Transformation, by Joyce C. Mills, Ph.D.
Hard case set includes book, deck, deck bag; Like new in original packaging; Deck never used. Discover how the science and spirit of the butterfly's development provides a powerful tool for personal growth and healing. Learn the secrets of transformation and find out how the cycles of the seasons parallel the butterfly's four stages of growth and our own passages to transformation. The Butterfly Wisdom set contains a 38 page book that details the four passages and seasons of transformation along with guidelines for using the 32 beautifully illustrated Butterfly Wisdom Action Cards that are included with the book. It also includes: 32 beautifully illustrated Butterfly Wisdom Action Cards, which include two decks: 20 cards in the Passages Deck and 12 cards in the Imaginal Disc deck. Along with these cards are 4 cards illustrating the Seasons of Transformation, 1 meditation card, and 4 instructional cards for using the Butterfly Wisdom Spreads. 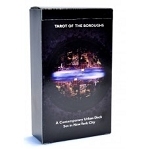 The four spreads include: Inner Balance Spread, Intuition Spread, Transformation Spread, and the Imaginal Disc Spread.